There are 7.7 billion people on this planet, however, only a few aim high and face the never-ending challenges to achieve their goals. One of these determined people is The Lord Mayor of Coventry, Councillor John Blundell. 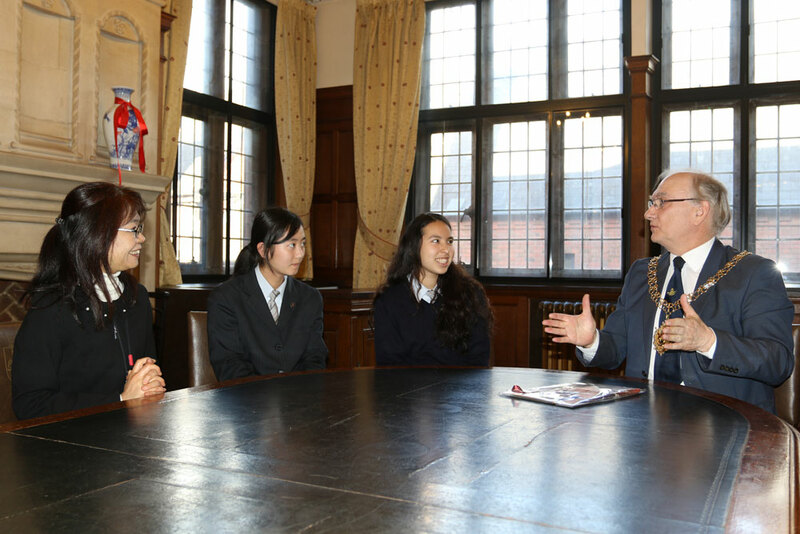 On the 5th March 2019, two Year 7 student reporters (Aleisha and Yara), Mrs Nguyen, Miss Urata, and her two students (Emi and Hanako) from our International Partner School in Hiroshima, had an incredible opportunity to have lunch with the Lord Mayor. At 11am, we got into our new school minibus, and began our journey to the Council House in Coventry. When we finally arrived, we found a friendly lady at the Reception area who took us upstairs. It didn’t take long to walk up a spacious wooden staircase that led to The Lord Mayor’s Office. Seven of us stood around a big wooden table that was in the centre of the room, and waited for him to make an entrance. Soon enough he did, and we all shook his hands in amazement, a little star-struck. We were meeting the Lord Mayor! It was like a dream! The Lord Mayor seemed equally as excited to meet us, it’s not every day you get to meet children from Hiroshima. When everybody had settled down, each of us took turns to tell the Lord Mayor a little about ourselves. In the process, we found out there were 26 Lord Mayors in the United Kingdom, and Coventry has one! We also found out that the ‘Chain of Office’ the Lord Mayor was wearing, was nearly 100 years old, and that the gold in it had a value of about £30,000! It was an unbelievable price and a very historical artefact. We were very amused by a short story the Lord Mayor began to share with us. He told the story of an event in Birmingham he attended to give out some honours. He was asked if the elephant on the Chain was from Africa or Asia. He wittingly replied that the elephant was from Coventry! The role of an Executive Mayor was created quite recently. In 1953, Her Majesty Queen Elizabeth II, gave Coventry a Charter called ‘Letters Patent’, entitling the City to have a Lord Mayor, and a special meeting was held on 9 July 1953 in St Mary’s Hall. The Lord Mayor serves for a one-year term of office and is apolitical. On 16th May 2019 the Lord Mayor, John Blundell, finishes his full term in office. In medieval times, green and red were traditional colours and it was thought that the elephant was treated as a religious symbol: not only as a beast who carried a tower – Coventry’s castle – full of armed men, but also as a symbol of Christ’s redemption of the human race. We soon moved on to the best part of the day, and tucked into our scrumptious sandwiches and refreshing orange juice with the Lord Mayor. The ambience of the room was relaxing and everyone attentively listened to the Lord Mayor’s stories. We asked many different questions, one of the most interesting was, “What are you going to do after your year of being the Lord Mayor?” He answered by saying he would take some time on holiday, as being Lord Mayor had prevented him from taking leave of absence, because he had many responsibilities in his role. We were impressed that the Mayor had devoted a year of his life to a good cause, and he inspired us all to set high goals and to find something we could be passionate about. 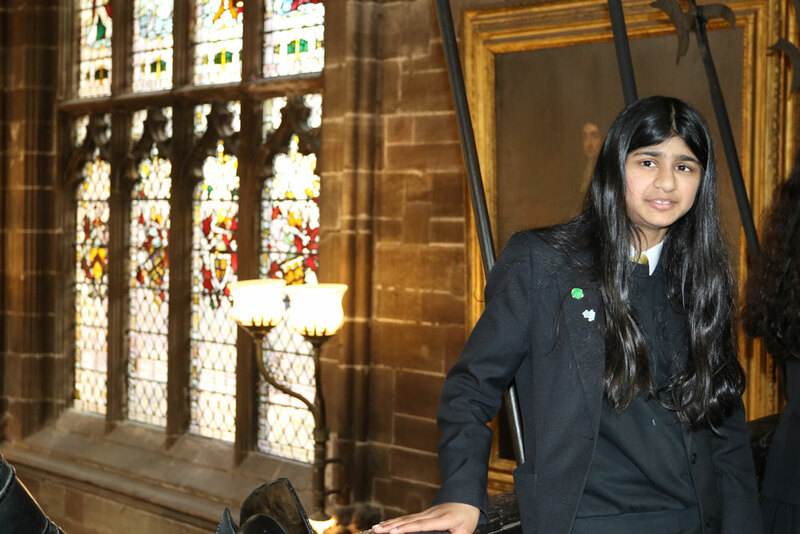 We were then all invited to visit the Council House Chambers (where citizenship ceremonies take place) and St Mary’s Guild Hall. The Hall was a surprise to us all. Guard armoury, frames, and a sense of history was spread out across the huge open space. We stood in awe to look at everything around us, the medieval architecture still standing strong today. The first recorded meeting of the Guild of St. Mary was dated back in 1342. 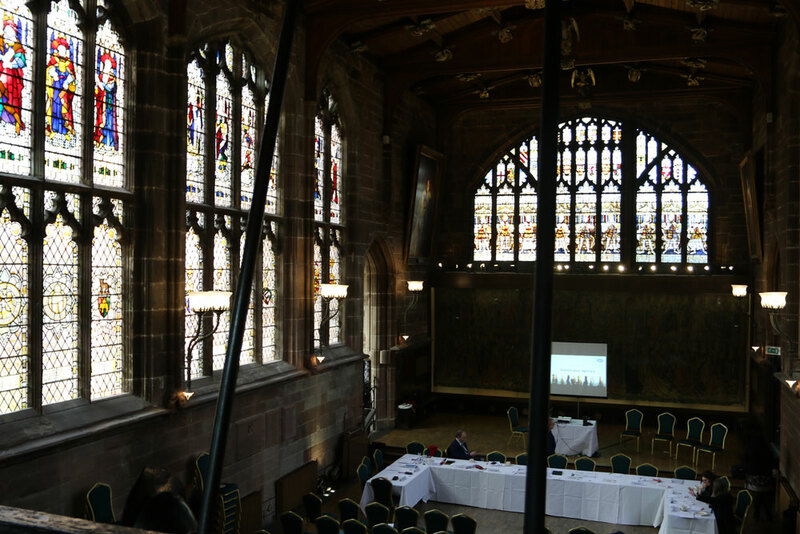 From the mid-14th century onwards, the Hall was used as a Council House, with Coventry ‘s first mayor, John Ward, being honoured in the Guildhall in 1349. Our visit soon came to an end and we left the Council House, taking in all the advice from the Lord Mayor and the history from the building. This was an amazing opportunity to have and it was all thanks to Mrs Nguyen for planning and for being in the Young Reporters’ team at Whitley Academy. We also want to thank Mr John Hartley for organising the opportunity so that we all could learn so many new things outside our classrooms. Thank you for reading this blog and remember to aim high and take all opportunities that come your way!